Striatal cholinergic (ChAT) and parvalbumin (PV) interneurons exert powerful influences on striatal function in health and disease, yet little is known about the organization of their inputs. Here using rabies tracing, electrophysiology and genetic tools, we compare the whole-brain inputs to these two types of striatal interneurons and dissect their functional connectivity in mice. ChAT interneurons receive a substantial cortical input from associative regions of cortex, such as the orbitofrontal cortex. Amongst subcortical inputs, a previously unknown inhibitory thalamic reticular nucleus input to striatal PV interneurons is identified. Additionally, the external segment of the globus pallidus targets striatal ChAT interneurons, which is sufficient to inhibit tonic ChAT interneuron firing. Finally, we describe a novel excitatory pathway from the pedunculopontine nucleus that innervates ChAT interneurons. These results establish the brain-wide direct inputs of two major types of striatal interneurons and allude to distinct roles in regulating striatal activity and controlling behavior. Successful behavior requires the proper control of actions based on the integration of a wide variety of information, including both environmental stimuli and internal state, being processed across numerous brain regions. The basal ganglia, particularly the striatum, its main input nucleus, is a major node in the integration of multiple cortical and subcortical inputs underlying action control and learning (Graybiel, 2000; Hikosaka et al., 1999; Jin and Costa, 2015; Yin and Knowlton, 2006). The striatum is primarily composed of spiny projection neurons (SPNs), which consist of ~95% of total striatal neuronal population (Gerfen et al., 1990). Yet, intermixed throughout the striatum are local interneurons, which exert powerful regulation on SPN activity (Gittis et al., 2010; Goldberg et al., 2012; Schulz and Reynolds, 2013; Silberberg and Bolam, 2015; Tepper et al., 2010). This interneuron population includes large, aspiny choline acetyltransferase (ChAT)-positive cholinergic interneurons as well as a multitude of GABAergic interneuron subtypes differentiated based on expression of parvalbumin (PV), somatostatin, calretinin and other neurochemical markers (Tepper et al., 2010). Numerous studies have suggested that striatal ChAT and PV interneurons exhibit different membrane properties, connectivity and effects on modulating SPN activity (Gittis et al., 2010; Lim et al., 2014; Silberberg and Bolam, 2015; Tepper et al., 2010). However, compared to the different subtypes of SPNs (Smith et al., 2016; Wall et al., 2013) or the interneurons in cerebral cortex or hippocampus (Freund and Buzsáki, 1996; Kepecs and Fishell, 2014; Wall et al., 2016), relatively little is known about the organization of inputs to striatal interneurons let alone their precise function. While ChAT interneurons account for only 1–2% of the total striatal population, the striatum contains some of the highest levels of cholinergic markers in the brain. Dysfunction of striatal ChAT interneurons has been implicated in numerous psychiatric disorders including schizophrenia, depression, and other mood disorders (Scarr et al., 2013), yet we lack a complete understanding regarding the input architecture to ChAT interneurons and their role in modifying behavior. ChAT interneurons are tonically active and exhibit a pause and subsequent rebound firing in response to the presentation of a cue predictive of reward or aversion (Ding et al., 2010; English et al., 2012; Kimura et al., 1984; Schulz and Reynolds, 2013). This conditioned pause is thought to encode the salience of external stimuli supporting the association of cue with action or outcome (Aosaki et al., 1994; Kimura et al., 1984; Ravel et al., 1999). Recently, striatal ChAT interneurons have been linked with behavioral flexibility and monitoring environmental state (Aoki et al., 2015; Apicella, 2007; Bradfield et al., 2013; Brown et al., 2010; Okada et al., 2014; Prado et al., 2017; Stalnaker et al., 2016). A vast majority of excitatory inputs to ChAT interneurons are thought to originate from centromedian and parafascicular nuclei of the thalamus (Ding et al., 2010; Lapper and Bolam, 1992); however, cortical stimulation has been shown to increase ChAT interneuron firing as well (Ding et al., 2010), suggesting a wealth of underappreciated cortical inputs. PV interneurons (also known as fast-spiking interneurons) constitute ~1% of the total striatal neuronal population and their dysfunction has been implicated in multiple movement disorders and neuropsychiatric disorders including Huntington’s disease, dystonia, obsessive-compulsive disorder (OCD) and Tourette’s syndrome (TS) (Burguière et al., 2015; Kalanithi et al., 2005). Recent studies have suggested that PV interneurons increased their activity during action sequences and sensory-based decision making; however, their exact function in controlling behavior remains to be clearly determined (Adler et al., 2013; Gage et al., 2010; Jin et al., 2014). These neurons are capable of firing at very high rates in vitro and in vivo (Gage et al., 2010; Jin et al., 2014) providing strong feedforward inhibition onto SPNs (Gittis et al., 2010; Koós and Tepper, 1999). Striatal PV interneurons are believed to receive inputs primarily from cortex and globus pallidus, with minimal thalamic innervation (Bevan et al., 1998; Mallet et al., 2012; Saunders et al., 2016). However, the inputs to striatal PV interneurons have not been exhaustively mapped, which might be crucial for understanding their function in controlling behavior. Here using rabies-mediated monosynaptic retrograde tracing and electrophysiology with optogenetics, we compare and analyze the whole-brain direct inputs to striatal ChAT and PV interneurons. Overall, ChAT and PV interneurons receive a vast majority of their inputs from the cortex. ChAT interneurons were found to preferentially receive inputs from association areas of cortex and thalamus. Among a wealth of different input targets revealed in the tracing study, we focus on the functional validation of three novel or underappreciated inputs to ChAT and PV interneurons. 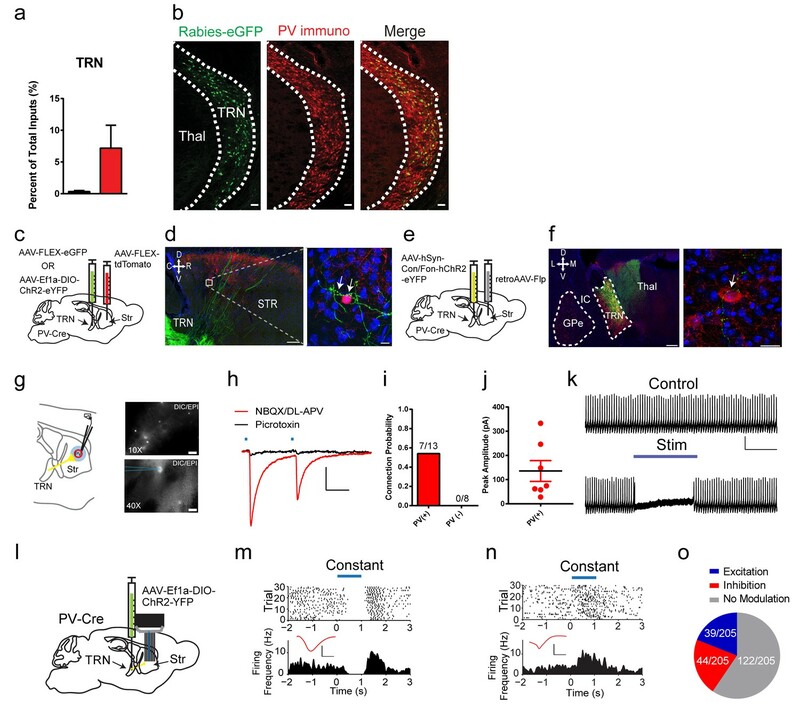 Specifically, a previously unknown inhibitory input from the thalamic reticular nucleus targeting PV interneurons was identified and functionally characterized. Additionally, an inhibitory pathway from the external segment of the globus pallidus to ChAT interneurons is explored, which robustly generates a pause in ChAT interneuron activity. We also identify a direct excitatory input from the pedunculopontine nucleus that targets ChAT interneurons. These results provide cell type-specific anatomical and functional connectivity for two major types of striatal interneurons providing insight into their role in controlling behavior. We used transgenic ChAT-Cre and PV-Cre mouse lines to target striatal ChAT and PV interneurons in the striatum. To validate Cre line specificity, a Cre-dependent AAV virus that expresses eGFP was injected into the dorsal striatum of either ChAT-Cre or PV-Cre mice (Figure 1a). The eGFP expression in striatum of ChAT-Cre and PV-Cre mice was highly specific as demonstrated by colocalization with immunohistochemical staining for choline acetyltransferase or parvalbumin (Figure 1a,b; Figure 1—figure supplement 1a–c, ChAT 95.9 ± 0.78%, PV 95.6 ± 0.79%). Additionally, ex vivo electrophysiological recordings of GFP-expressing ChAT or PV interneurons show typical electrophysiological properties (Figure 1c). ChAT interneurons are tonically active, have depolarized resting membrane potentials, and feature prominent hyperpolarization-activation cation currents (Figure 1c), while PV interneurons exhibit narrow action potentials and high firing rates (Gittis et al., 2010; Tepper et al., 2010). These results demonstrate that the ChAT-Cre and PV-Cre lines are highly selective in striatum and therefore appropriate for investigating the inputs to striatal ChAT and PV interneurons. Monosynaptic tracing reveals the inputs to striatal ChAT and PV interneurons. (a) Schematic of Cre-dependent AAV-eGFP viral injection in ChAT-Cre or PV-Cre mice. (b) AAV-eGFP expression is highly colocalized with ChAT and PV immunostaining, respectively. Scale bars, 100 µm. inset (red box), scale bar 25 µm. Red arrows denote colocalization. ec, external capsule. (c) Representative traces of (top) ChAT and (bottom) PV interneuron to hyperpolarizing and depolarizing current injection (step −250 pA,+250 pA). Scale bars, 250 ms, 50 mV. (d) Schematic of Cre-dependent AAV helper viruses and modified rabies virus injections in ChAT-Cre mice. (e) Series of representative sagittal sections containing inputs to ChAT interneurons. (f) Schematic of Cre-dependent AAV helper viruses and modified rabies virus injections in PV-Cre mice. (g) Series of representative sagittal sections containing inputs to PV interneurons. Only the injection hemisphere is shown. Scale bars, 1 mm; inset scale bars; 500 µm. Brain regions are highlighted in white lettering. OFC, orbital frontal cortex; M1, primary motor cortex; M2, secondary motor cortex; S1, primary somatosensory cortex; GPe, globus pallidus external segment; Cl, central lateral thalamic nuclei; Pf, parafascicular thalamic nucleus; AM, anteromedial thalamic nucleus; MD, mediodorsal thalamic nucleus; VM, ventromedial thalamic nucleus; STN, subthalamic nucleus, SNc, substantia nigra pars compacta; SNr, substantia nigra pars reticulata; PPN, pedunculopontine nucleus; TRN, thalamic reticular nucleus. The following figure supplements are available for Figure 1: Figure 1—figure supplement 1 and Figure 1—figure supplement 2 for additional coronal images and starter cell quantification, respectively. 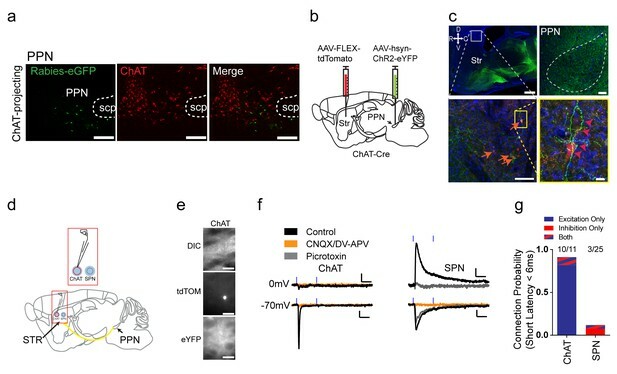 To determine the differences in inputs to striatal ChAT and PV interneurons, we performed Cre-dependent, modified rabies virus tracing (Guo et al., 2015; Wickersham et al., 2007) in the dorsal striatum of ChAT- or PV-Cre mice from unilateral viral injections into the same location (See Materials and methods, Figure 1d–g; Figure 1—figure supplement 1d–i; ChAT n = 6, PV n = 5). All starter cells were found to be restricted to the dorsal striatum without any cortical expression (Figure 1—figure supplement 2a,b). There was no difference in the total number or the striatal subregion distribution between ChAT and PV starter neurons (Figure 1—figure supplement 2c–g). In both Cre mice, eGFP-positive projection neurons were found throughout cortex, thalamus, basal ganglia and other subcortical regions (Figure 1e,g; Figure 1—figure supplement 2f,g). Labeling on the ipsilateral side throughout the brain was quantified relative to brain region boundaries (as defined by the Allen Institute Mouse Brain Reference Atlas). There was no significant difference in the total number of input neurons for ChAT and PV interneurons (ChAT 6580 ± 2657, PV 4456 ± 1540; two-tailed t-test, p=0.4773). A cutoff of greater than 0.4% was used to distinguish between major and minor inputs to these interneuron populations (Figure 2a for all major inputs, see a complete list in Figure 2—figure supplement 1 with a statistical comparison between ChAT and PV inputs). Summary of brain-wide direct inputs to striatal ChAT and PV interneurons. (a) Major input regions (>0.4% of total inputs) to ChAT (black bar) and PV (red bar) interneurons. A complete set of all inputs to ChAT and PV interneurons is shown in Figure 2—figure supplement 1. (b) ChAT and PV interneurons receive predominately cortical innervation (two-way ANOVA, F(3,36) = 325.1, p<0.0001). (c) Cortical laminar distribution of all inputs to ChAT and PV interneurons. ChAT interneurons receive a significant bulk of inputs from layer five compared to other cortical layers (two-way ANOVA, Sidak’s, 5 vs. 6, p<0.0001; 2/3 vs. 6, p=0.0019; 2/3 vs. 5, p=0.0041). (d) Sorted association and sensorimotor cortex inputs to ChAT and PV interneurons (see Materials and methods). ChAT interneurons receive a greater percentage of associative versus sensorimotor inputs (two-way ANOVA, Sidak’s, p=0.0001). (e) Association cortex laminar distribution is biased to superficial layers. ChAT interneurons receive more associative layer 2/3 than layer six projections and more layer 5 than six projections (two-way ANOVA, Sidak’s, layer 2/3 vs. 6, p<0.0001, layer 5 vs. 6, p=0.0012). PV interneurons also receive more associative layer 2/3 than layer 5 and 6 projections (two-way ANOVA, Sidak’s, layer 2/3 vs. 6, p<0.0001, layer 2/3 vs 5, p=0.0029). (f) Sensorimotor cortex laminar distribution is biased to deep layers. ChAT interneurons receive more sensorimotor layer five projections than layer 2/3 or layer six projections (two-way ANOVA, Sidak’s, layer 5 vs. 6, p=0.0010, layer 2/3 vs. 5, p=0.0086). PV interneurons receive more sensorimotor layer 5 than layer 2/3 projections (two-way ANOVA, Sidak’s, layer 2/3 vs. 5, p=0.0018). All figures mean ± SEM. In blue, *p≤0.05, **p≤0.01, ****p≤0.0001, # p<0.08. The following figure supplements are available for Figure 2: Figure 2—figure supplements 1 and 2. The tracing results revealed that both types of striatal interneurons received a vast majority of inputs from the cortex (Figure 2b, two-way ANOVA, F (3, 36)=325.1, p<0.0001), with the remaining inputs coming from various thalamic nuclei, other basal ganglia nuclei, and a variety of other subcortical regions. ChAT interneurons received substantial inputs from cingulate cortex and secondary motor cortex. PV interneurons received extensive inputs from similar cortical regions with the addition of a substantial primary motor and primary somatosensory cortical inputs (Figure 2a). We observed input neurons to ChAT or PV interneurons from layer 2/3, 5, and 6 of cortex (Figure 2c). ChAT interneurons received significantly more inputs from layer five compared to all other cortical layers and more layer 2/3 compared to layer six projections (Figure 2c; two-way ANOVA, Sidak’s, 5 vs. 6, p<0.0001; 2/3 vs. 6, p=0.0019; 2/3 vs. 5, p=0.0041). When grouping the cortical inputs into association-like (e.g. orbital, insula, prelimbic, cingulate, M2, S2, RS, and PPC, see Materials and methods) and sensorimotor-like regions (e.g. M1, S1, AUD, VIS), ChAT interneurons received significantly more inputs from associative than sensorimotor cortex (Figure 2d, two-way ANOVA, Sidak’s multiple comparisons test, p=0.0001). Examination of the laminar distribution in associative versus sensorimotor cortical regions revealed a unique pattern. Inputs in associative cortex are superficial preferring (layer 2/3) while sensorimotor inputs are more prominent in deeper layers (layer 5/6) (Figure 2e,f) (Smith et al., 2016). Association cortex inputs to ChAT interneurons were layer 2/3 dominant with significantly more layer 2/3 inputs than layer six and more layer five inputs than layer 6 (Figure 2e; two-way ANOVA, Sidak’s, layer 2/3 vs. 6, p<0.0001, layer 5 vs. 6, p=0.0012). Similarly, PV interneurons association cortical inputs were more layer 2/3 preferring (Figure 2e; two-way ANOVA, Sidak’s, layer 2/3 vs. 6, p<0.0001, layer 2/3 vs 5, p=0.0029). Sensorimotor inputs to ChAT interneurons originated predominately from layer 5 (Figure 2f; two-way ANOVA, Sidak’s, layer 5 vs. 6, p=0.0010, layer 2/3 vs. 5, p=0.0086. PV interneurons also received significantly more sensorimotor layer 5 than layer 2/3 projections (Figure 2f; two-way ANOVA, Sidak’s, layer 2/3 vs. 5, p=0.0018). These results show that although both types of striatal interneurons receive more superficial association cortex inputs and more deep layer sensorimotor cortex inputs, ChAT interneurons receive more associative cortical inputs overall. The previous literature on thalamostriatal projections suggests that intralaminar nuclei mainly target striatal ChAT interneurons or SPNs (Ding et al., 2010; Smith et al., 2004), however a growing body of work also suggest intralaminar thalamic nuclei also target PV interneurons (Arias-García et al., 2017; Assous et al., 2017; Sciamanna et al., 2015; Sidibé and Smith, 1999). While all four intralaminar nuclei had inputs targeting ChAT interneurons, our dG-rabies tracing revealed that PV interneurons also received significant projections from intralaminar thalamus (Figure 2a). Interestingly, ChAT interneurons have inputs from all intralaminar nuclei and associative thalamic nuclei like mediodorsal thalamus (Figure 2a). Together, these data suggest that like association cortex, associative thalamic nuclei and intralaminar nuclei also have a substantial proportion of inputs targeting striatal ChAT interneurons. Our dG-rabies tracing surprisingly revealed that PV interneurons receive a projection from the thalamic reticular nucleus (TRN) (Figure 2a, Figure 3a). The TRN is a thin shell of GABAergic neurons that was thought to project within thalamus regulating thalamocortical and corticothalamic communications (Halassa and Acsády, 2016). The rabies-eGFP signal was clearly located within the TRN as evidenced by colocalization with parvalbumin (PV) or somatostatin (SOM) immunostaining (Clemente-Perez et al., 2017) (Figure 3b, Figure 3—figure supplement 1e,f, PV: rabies-eGFP colocalization 33.44 ± 6.08%, SOM: rabies-eGFP colocalization 43.73 ± 3.88%), and was enriched in the most rostral pole of the TRN. Noticeably, the labeling of TRN was never observed in control experiments with either helper or rabies virus alone nor were TVA-mCherry starter cells observed in TRN (Figure 1—figure supplement 1h,i). In order to anatomically validate this projection from TRN to PV interneurons independently, three additional viral tracing experiments were performed. In the first approach, anterograde tracing from TRN in PV-Cre mice with a Cre-dependent AAV expressing eGFP (Figure 3c), showed that labeled TRN neurons sent projections coursing rostrally into the striatum and form close appositions to PV interneuron somas and proximal dendrites (Figure 3d). Secondly, using a convergent intersectional approach to trace TRN projections, a retrograde AAV virus (Tervo et al., 2016) carrying Flp-recombinase was injected into dorsal striatum of a PV-Cre mouse, while a dual necessity Cre-/Flp- recombinant INTRSECT AAV virus was injected in TRN (Figure 3e). Following transfection, eYFP-expressing cell bodies were seen in the anterior TRN, but not surrounding areas like GPe, with clear axonal projections observed in the dorsal thalamus (Figure 3f). Utilizing striatal PV immunostaining, eYFP fibers from TRN were observed to be in close apposition to PV cell somas in the striatum (Figure 3f). As an additional confirmation of TRN to striatal connectivity we injected Somatostatin-IRES-Cre mice with Cre-dependent AAV-FLEX-eGFP to label TRN neurons (Figure 3—figure supplement 1g–i). TRN expressed eGFP selectively and eGFP-positive fibers can be seen near PV interneurons in striatum. Thus, these three viral tracing experiments have independently verified the rabies tracing results and confirmed a previously unknown projection from TRN to striatal PV interneurons. A projection from thalamic reticular nucleus to striatal PV interneurons. (a) PV interneurons receive a thalamic reticular nucleus (TRN) projection. (b) Rabies-eGFP positive neurons in TRN colocalize with PV immunostaining. Scale bar, 50 µm. Thal = thalamus. (c) Anterograde viral injection scheme to validate TRN to PV interneuron projection. (d) (left) Cre-dependent AAV eGFP is injected in TRN and Cre-dependent AAV tdTomato injected in the dorsal striatum of a PV-Cre mouse. Scale 200 µm. (right) 63x image of eGFP positive terminals on PV interneuron (red) somas and proximal dendrites (white arrows). Scale 10 µm. (e) A convergent intersectional viral approach to trace TRN projections to striatum. (f) (left) Expression of eYFP in anterior TRN cell bodies and axons seen projecting to dorsal thalamus. Note lack of expression in neighboring GPe. Scale bar, 200 µm. (right) Following PV immunostaining, eYFP fibers (yellow-green) from TRN were observed in close apposition to PV cell somas (red). Scale bar, 20 µm. (g) (left) Slice preparation to functionally validate TRN to PV interneuron projections. (right) Overlays of DIC and red channel epifluorescence at 10x (top) and 40x (bottom). Scale bars 200 µm, 20 µm. (h) Whole-cell recordings of paired light evoked IPSCs (50 ms ISI) following TRN terminal stimulation. IPSCs are blocked with GABAAR antagonist, picrotoxin (50 µM). Scale bars, 25 ms, 100 pA. PV (+) cells are held at −70 mV. (i) Striatal PV interneurons showed a fast latency, reliable light evoked IPSC, which is absent in the neighboring SPNs. (j) Individual IPSC current amplitudes of connected cells. (k) One second constant blue laser TRN axon stimulation is sufficient to suppress current injection-induced spiking in a PV interneuron. Scale bars, 500 ms, 25 mV. (l) Optogenetic stimulation of TRN terminals in the striatum was paired with extracellular neuronal recordings using a multi-electrode array. (m–n) Exemplar (top) spike raster and (bottom) firing frequency perievent time histogram (PETH) from a SPN exhibiting slow latency light-evoked inhibition (m), or exhibiting slow latency light-evoked excitation (n). Inset (red): Average single unit waveforms of a putative SPN. Scale bars 0.2 ms, 50µV. (o) Approximately 40% (83/205) of neurons show light-induced firing rate modulation. Half of the responsive SPN population (44/83) exhibited delayed inhibition (red), while others (39/83) exhibited slow latency excitation (blue). See Figure 3—figure supplement 3 for putative PV interneuron light-evoked responses. The following figure supplements are available for Figure 3: Figure 3—figure supplements 1–3. To further test the functional connectivity of this projection from TRN to striatal PV interneurons, whole-cell voltage clamp recordings from PV interneurons following TRN terminal stimulation were conducted (Figure 3g). Brief paired blue laser stimulation of TRN ChR2-positive terminals in the striatum over PV interneurons, in the presence of AMPAR and NMDAR antagonists, exhibited fast latency, monosynaptic IPSCs in 53.8% (7/13) of the cells recorded (Figure 3h–j). These large, reliable, and paired-pulse depressing IPSCs were blocked by the GABAAR antagonist picrotoxin (Figure 3h). Connectivity was not determined by location as PV interneurons in close proximity to other connected PV interneurons did not show connectivity in the same brain slice. Considering potential subtypes of PV interneurons in striatum(Garas et al., 2016), we compared resting membrane properties including capacitance, membrane potential, tau and holding current between TRN connected and non-connected PV interneurons, and no significant differences were observed (Figure 3—figure supplement 1a–d). In order to test the selectivity of this input, neighboring PV-negative cells (putative SPNs) were also recorded, yet none of these neurons exhibited any functional connectivity (0/8 cells) (Figure 3i). In current clamp, one second constant blue laser stimulation of TRN axon terminals was sufficient to suppress current injection-evoked spiking in PV interneurons (Figure 3k). These results are consistent with the viral tracing data and suggest a selective, functional TRN inhibitory input to striatal PV interneurons. To determine if the TRN is sufficient to inhibit PV interneurons and affect basal ganglia outputs in vivo, optogenetic stimulation of TRN terminals in the striatum was paired with extracellular neuronal recordings using a multi-electrode array (Figure 3l, see Figure 3—figure supplement 2 for array placement) (Howard et al., 2017; Jin et al., 2014). Of the over two hundred putative SPNs recorded, around 40% show a firing rate change during light stimulation (83/205). Noticeably, half of the responsive SPN population (44/83) exhibited delayed inhibition during the one second constant laser stimulation (Figure 3m,o) while others (39/83) exhibited slow latency excitation (Figure 3n,o). While the firing modulation observed in SPNs represents the net network effects of TRN stimulation on basal ganglia output, potential disinhibition of SPNs via TRN inhibition of striatal PV interneurons may contribute to some of these effects. Indeed, four putative striatal PV interneurons (fast-spiking interneurons) were identified in our recordings and all of them show inhibited firing activity during TRN terminal stimulation (Figure 3—figure supplement 3). Overall, TRN is capable of functionally regulating striatal PV interneurons and affecting basal ganglia output in vivo. While previous studies focused on the excitatory inputs to striatum (Ding et al., 2010; Lapper and Bolam, 1992), inhibition also plays an important role in controlling striatal activity, especially through interneurons (Koós and Tepper, 1999; Silberberg and Bolam, 2015; Tepper et al., 2010). In addition to the novel inhibitory input to striatum from TRN, we explored another major inhibitory projection to the striatum from the GPe (Bevan et al., 1998; Gittis et al., 2014; Mallet et al., 2012; Saunders et al., 2016). Rabies tracing revealed that all basal ganglia nuclei similarly innervate both ChAT and PV interneurons, and of these basal ganglia inputs, GPe was the most predominant (two-way ANOVA, F (6, 63)=27.27, p<0.0001, Figure 4—figure supplement 1a). Previous studies have suggested that GPe primarily targets PV interneurons and SPNs (Bevan et al., 1998; Gittis et al., 2014; Mallet et al., 2012; Saunders et al., 2016) along with evidence of an anatomical connection to ChAT interneurons (Guo et al., 2015; Mallet et al., 2012). However, our rabies tracing results found that similar proportions of GPe neurons project to both striatal ChAT and PV interneurons (Figure 4—figure supplement 1a). To begin to characterize this GPe projection to ChAT and PV interneurons, rabies-labeled GPe brain sections were immunohistochemically stained for different cell markers (Hernández et al., 2015; Mallet et al., 2016), and few rabies-eGFP GPe neurons were colocalized with either PV immmunostaining (ChAT-projecting: 3.5%, PV-projecting: 2.8%; Figure 4—figure supplement 1b–e) or ChAT immmunostaining (ChAT-projecting: 1.6%, PV-projecting: 1.3%; Figure 4—figure supplement 1c,d). Consistent with previous studies, transcription factors NPAS1 and FoxP2, which are enriched in pallidostriatal projection neurons (Glajch et al., 2016; Hernández et al., 2015), colocalized with a large population of retrogradely labeled eGFP-positive rabies neurons. Rabies eGFP expression for striatal ChAT or PV-projecting GPe neurons colocalized similarly with all immunohistochemical markers tested (Figure 4—figure supplement 1c). These data suggest that ChAT and PV interneurons receive comparable numbers of input neurons from potentially overlapping populations of GPe cell types. To functionally confirm the GPe to striatal connection, pairs of ChAT interneurons and neighboring SPNs were recorded in voltage clamp with brief laser stimulation of ChR2-expressing GPe terminals in striatum. Fast latency, monosynaptic IPSCs were observed in both ChAT-positive (11/11) and ChAT-negative neurons (putative SPNs, 7/7) (Figure 4a,b). These IPSCs were confirmed by blockade with the GABAAR antagonist picrotoxin (Figure 4b). IPSC amplitudes and probability of release from neighboring ChAT and SPNs were similar (Figure 4—figure supplement 2a–c), but SPNs had increased inverse of the coefficient of variation squared (1/(CV)^2) (Figure 4—figure supplement 2d, Mann Whitney, p=0.0114), a presynaptic measure suggesting increased number or function of inhibitory synapses on SPNs. Recordings from pairs of PV interneurons and neighboring SPNs revealed that PV interneurons exhibited larger IPSCs (two-tailed t-test, p<0.0001), higher release probability (two-tailed t-test, p=0.0114), and greater 1/(CV)^2 (two-tailed t-test, p=0.0277) (Figure 4b, Figure 4—figure supplement 2e–g), suggesting GPe inhibitory presynaptic release and/or number of synapses is greater on PV interneurons than on SPNs (Bevan et al., 1998; Gittis et al., 2014; Glajch et al., 2016; Mallet et al., 2012; Saunders et al., 2016). Overall, the ChAT to SPN IPSC ratio was lower than the PV to SPN ratio, suggesting increased functional connectivity from GPe to PV compared to ChAT interneurons, despite similar numbers of GPe neurons projecting to both (Figure 4c, Mann Whitney test, p=0.0076). Functional projections of GPe to striatal ChAT and PV interneurons. (a) Experimental approach to label GPe inputs with ChR2 and express tdTomato in ChAT or PV interneurons. (b) Averaged paired-pulse (50 ms ISI) light-evoked IPSCs in striatal ChAT interneuron (black), PV interneuron (red) and SPN (grey) following GPe terminal stimulation in striatum. Cells are held at −10 mV in the presence of AMPAR (10 µM CNQX) and NMDAR (50 µM DL-APV) antagonists. IPSCs are blocked by the GABAAR antagonist picrotoxin (100 µM) (light blue trace). Scale bars, 100 ms, 200 pA. See Figure 4—figure supplement 2 for detailed quantification. (c) The ChAT/SPN paired IPSC ratio is lesser than the PV/SPN paired IPSC ratio (Mann Whitney Test, p=0.0076). (d–e) ChAT interneuron tonic firing is paused by light-evoked stimulation of striatal GPe terminals, evident from single trace (d) and the firing rate PETH (e). Scale bars, 1 s, 20 mV. Dark line represents mean and shading denotes SEM in PETH. GPe terminal stimulation promotes ChAT tonic firing activity pause (two-tailed t-test, p=0.0014) and subsequent rebound (two-tailed t-test, p=0.0469). See Figure 4—figure supplement 2h–j for multiple trial raster and quantification. (f–g) Suppression of spiking activity in striatal PV interneurons following GPe terminal stimulation for single trace (f), and the firing rate PETH (g). Scale bars, 250 ms, 25 pA. Quantification of suppression of PV interneuron spiking activity by GPe terminal stimulation (two-tailed t-test, p=0.0401). See Figure 4—figure supplement 2k,l for multiple trial raster and quantification. (h) In vivo recording of striatal SPNs during optogenetic stimulation of GPe terminals in striatum. (i–j) Representative SPNs showing excitation (i) or inhibition (j) during optogenetic GPe terminal stimulation. Inset (red): Average single unit waveforms of a putative SPN. Scale bars 0.2 ms, 50µV. (k) Pie chart of light modulated SPNs firing activity following GPe laser stimulation. The following figure supplements are available for Figure 4: Figure 4—figure supplements 1 and 2. Pauses in ChAT interneuron firing are associated with cues that predict reward (Kimura et al., 1984), so we next tested if these inhibitory GPe inputs to striatum are capable of suppressing tonic ChAT firing. In whole-cell current clamp recordings, ChAT interneurons were tonically active and rested at modestly depolarized potentials (~ −60 mV, Figure 4d). Interleaved blue laser light stimulation of GPe inhibitory terminals on ChAT interneurons was sufficient to significantly reduce tonic firing (Figure 4d, Figure 4—figure supplement 2h–j, two-tailed t-test, p=0.0043). After cessation of laser stimulation, ChAT neurons showed significant rebound activity spiking at rates above baseline (Figure 4e, Figure 4—figure supplement 2h–j, two-tailed t-test, p=0.0469). Furthermore, inhibitory inputs from GPe were sufficient to inhibit current injection-induced spiking in PV interneurons for a few hundred milliseconds following blue laser stimulation (Figure 4f,g; Figure 4—figure supplement 2k,l; two-tailed t-test, p=0.0401). These data suggest that SPNs, striatal ChAT and PV interneurons all receive inhibitory inputs from GPe, which is sufficient to generate pause-burst activity in ChAT interneurons and suppression of spiking in PV interneurons. To further explore the net functional effects of GPe to striatum projections in vivo, extracellular recordings paired with optogenetic stimulation of ChR2-expressing GPe terminals in striatum were performed (Figure 4h). It revealed that of all the SPNs responsive to GPe terminal stimulation (22/81), the majority showed inhibited firing activity (16/22) while a small proportion was excited (6/22) (Figure 4i–k). These results suggest that GPe sends a prominent inhibitory input to both striatal ChAT and PV interneurons and exert powerful feedback control on striatal activity. The pedunculopontine nucleus (PPN), a part of the ascending reticular activating system, has been observed to project directly to the striatum (Dautan et al., 2014); yet, the cell type and physiology of this pathway has not been fully elucidated. Notably, in the rabies tracing data, PPN had a noticeable bias to ChAT interneurons, compared to other subcortical projections (two-way ANOVA, F (1, 72)=6.034, p=0.0008). PPN projections to striatum were previously thought to be cholinergic (Dautan et al., 2014). However, no overlap in immunostaining for ChAT and eGFP rabies-labeled neurons in the PPN was observed (Figure 5a). To begin to characterize this long-range connection, non-Cre dependent AAV-ChR2 was injected into PPN and terminals were observed innervating all basal ganglia nuclei, including striatum (Figure 5b). Interestingly, while the eGFP axon terminal expression in the striatum was sparse, it was directed, wrapping the cell somas and proximal dendrites of ChAT interneurons (Figure 5c). Overall these data suggest that PPN sends a non-cholinergic projection to striatum that preferentially targets ChAT interneurons. Excitatory projections from pedunculopontine nucleus to striatal ChAT interneurons. (a) Rabies-labeled projections to striatal ChAT interneurons from the PPN are not cholinergic. Note no colocalized eGFP (green) and ChAT immunostaining (red). scp, superior cerebellar peduncle. Scale bars, 200 µm. (b) Viral injection scheme to anterogradely verify the PPN projections to striatum. (c) (left) Sagittal image of eYFP terminal expression following injection of AAV-ChR2-eYFP in PPN. Scale bar, 1 mm (top). (right) Sagittal image of PPN injection site with AAV-ChR2-eYFP expression. Scale bar, 100 µm. Note many eYFP fibers from PPN target on tdTomato expressing ChAT interneurons (orange and pink arrowheads). Scale bar, 200 µm (left), 20 µm (right). (d) Diagram for functional validation of PPN projections to striatum in brain slices. (e) DIC and epifluorescent images of patched dorsal striatal ChAT and neighboring SPN neurons. Scale bar, 200 µm (DIC), 50 µm (epifluorescent). (f) Example average current trace at −70 mV or 0 mV under control (black), after blocking AMPAR and NMDAR currents (yellow) or blocking GABAAR currents (grey). Scale bar, 25 ms, 25 pA. (g) Percentage of ChAT and SPN neurons exhibiting fast latency (<6 ms) excitatory (blue), inhibitory (red) or both (blue/red stripes) currents following PPN terminal stimulation. 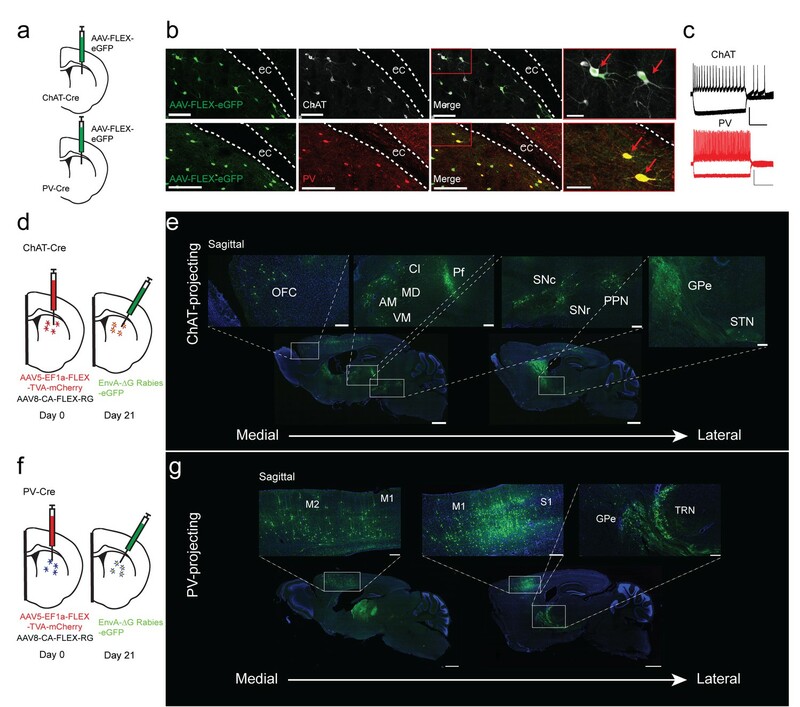 To functionally explore this input and confirm the anatomical findings, whole-cell voltage clamp recordings of ChAT interneurons combined with optogenetic stimulation of PPN terminals was used to determine connectivity and input type (Figure 5d–f). PPN is a heterogeneous hindbrain nucleus composed of cholinergic, glutamatergic and GABAergic neurons (Martinez-Gonzalez et al., 2011; Mena-Segovia et al., 2009). Recordings at the reversal potential for excitatory and inhibitory transmission before and after the addition of AMPAR/NMDAR antagonists or GABAAR antagonists was used to determine if PPN axon terminals are excitatory or inhibitory, respectively (Figure 5f). ChAT interneurons exhibited fast latency, monosynaptic (<6 ms), excitatory currents in a vast majority of neurons sampled (10/11), while only a few neighboring SPNs (3/25) exhibited fast latency (<6 ms), excitatory or inhibitory connections (Figure 5g). Notably, the current experiments do not allow us to disambiguate neurotransmitter co-release from a single terminal or differing classes of PPN inputs on a single striatal interneuron (Wang and Morales, 2009). Overall, these results suggest that different from SPNs, ChAT interneurons receive strong functional excitatory inputs on the soma and proximal dendrites from PPN. While some hints at specifying afferent inputs to ChAT and PV interneurons have been observed with anterograde tracers or ultrastructural studies (Chang and Kita, 1992; Gonzales et al., 2013; Mallet et al., 2005; Mallet et al., 2012; Ramanathan et al., 2002), more comprehensive information on the brain-wide inputs are needed for quantitative comparisons and providing further insights into their functional roles in behavior. Our tracing results suggest that the majority of excitatory inputs to both ChAT and PV interneurons come from the cerebral cortex. Our data confirm previous reports that striatal PV interneurons receive substantial inputs from M1 and S1 (Parthasarathy and Graybiel, 1997; Ramanathan et al., 2002), suggesting a role for PV interneurons in sensorimotor integration. In contrast, we found that projections from associative regions of cortex, including the orbital and cingulate cortex, and the associative regions of the thalamus, including intralaminar nuclei and mediodorsal nucleus, preferentially targeted ChAT interneurons. The orbital cortex has been shown to be involved in decision making, reversal learning and shifting from goal-directed to habit learning (Gourley et al., 2013; Gremel and Costa, 2013; McAlonan and Brown, 2003). The cingulate cortex has been described as an interface between motivation, cognition and action with roles associated with effort, action value, reward expectancy, and behavioral flexibility (Cowen et al., 2012; Hadland et al., 2003; Hayden and Platt, 2010; Johnston et al., 2007; Paus, 2001; Shidara and Richmond, 2002; Walton et al., 2004). The thalamic intralaminar nuclei and mediodorsal nucleus are involved in attention and cognitive processing of information (Kimura et al., 2004; Minamimoto and Kimura, 2002; Parnaudeau et al., 2013). This preferential connectivity suggests a specific role of ChAT interneurons in context-dependent modulation of action and behavioral flexibility (Matamales et al., 2016). Indeed, recent work suggests cholinergic interneurons use orbitofrontal inputs to track current environmental state during behavior (Stalnaker et al., 2016). Furthermore, we find a novel, functional excitatory pathway from the PPN to striatal ChAT interneurons. This pathway, part of the ascending reticular activating system, may coordinate with the basal forebrain to regulate levels of arousal in cortex and striatum concomitantly, representing a mechanism of context-dependent gain control of behavior (see Figure 2—figure supplement 2 for visual anatomical summary of ChAT and PV inputs). When our current data are considered collectively with previous studies using monosynaptic rabies tracing from other striatal cell types (Smith et al., 2016; Wall et al., 2013), a general theme appears. Each cell type in the striatum appears to have access to the same inputs within a topographic domain (Hintiryan et al., 2016), but significant preferences do exist for certain cell types, which imbues functional distinctions. In the case of direct and indirect pathway SPNs, it was found that the amygdala almost exclusively targeted direct pathway, but not indirect pathway SPNs (Wall et al., 2013). For the patch/matrix SPNs, the most prominent distinction was limbic subcortical inputs, primarily from the bed nucleus of the stria terminalis preferentially innervating the patch compartment (Smith et al., 2016). For ChAT and PV interneurons, our rabies tracing indicates a number of differences that lend insight into the differential role these interneuron subtypes in regulating striatal output to control action selection and learning. Interestingly, when analyzing the cortical laminar breakdown in associative versus sensorimotor cortices we observed more superficial layer projections from associative cortex versus more deep layer projections from sensorimotor cortex in both the ChAT and PV rabies tracing dataset, which was also observed in the patch/matrix rabies tracing data set (Smith et al., 2016). This laminar organization may be a general organizing principle of the cortical inputs to the dorsal striatum. Most previous studies have focused on the excitatory inputs to striatum (Ding et al., 2008; Ding et al., 2010). Here we report a novel, GABAergic input from the TRN that projects to striatal PV interneurons. This reliable, short latency TRN-PV pathway was sufficient to inhibit PV interneuron spiking and alter SPN activity in vivo. However, additional interneuron subtypes will need to be tested to determine the precise mechanism of TRN-mediated SPN modulation. Traditionally, TRN is thought to send projections only within thalamus regulating thalamocortical communications and acting as an attentional spotlight or filter (Pinault, 2004). In these models, when one sensory modality is active during attention, a winner-take-all network between thalamus-TRN reciprocal connections would inhibit the other modality and facilitate information processing in the attended domain. The projection from TRN to striatal PV interneurons found in our current study was first identified through rabies tracing experiments. This projection represents a substantial and selective inhibitory input to striatal PV interneurons as this pathway has not been observed in previous rabies tracing datasets on other striatal cell types (Guo et al., 2015; Smith et al., 2016; Wall et al., 2013). This pathway was further verified independently by anterograde and intersectional tracing experiments in two separate mouse lines along with slice electrophysiology combined with optogenetics. The function of this TRN-striatal PV interneuron pathway could be particularly significant. Activation of TRN inputs would inhibit PV interneuron activity and potentially excite SPNs via disinhibition. Our electrophysiological recordings from brain slices detected large IPSCs in more than half of striatal PV interneurons sampled. Using in vivo striatal recordings with optogenetic stimulation of TRN terminals in striatum, we observed that putative striatal fast spiking interneurons (FSIs) were inhibited during optical stimulation, while a subpopulation of SPNs showed firing rate modulation either directly via PV interneurons or indirectly through a network effect. This subcortical pathway is well positioned to relay attention-related information directly to the striatum. By targeting striatal PV interneurons, we speculate that it might be possible to effectively bias action selection and coordinate an animal’s ongoing behavior with corresponding attentional state (Berke, 2011; Gage et al., 2010; Jin et al., 2014). Potentially, this pathway could serve as a subcortical bridge for promptly coordinating sensory attention and actions. Previous data suggested that GPe projected to striatal PV interneurons and SPNs (Bevan et al., 1998; Mallet et al., 2012) with some anatomical evidence of a projection to ChAT interneurons (Guo et al., 2015; Mallet et al., 2012). Our rabies tracing data confirmed these connections as well as demonstrated for the first time a functional connection from GPe to striatal ChAT interneurons. The GPe projections to striatal ChAT and PV interneurons draw from similar proportions of NPAS1, FoxP2 and a small minority of PV and ChAT neurons. However, we did observe a population of rabies-eGFP neurons that did not colocalize with any of the immunohistochemical markers, potentially suggesting another subtype such as Lhx6-expressing GPe neurons (Mastro et al., 2014). Utilizing whole-cell recordings, we confirmed that the GPe has a high degree of connectivity to both striatal ChAT and PV interneurons, as well as SPNs. In classical Pavlovian conditioning or stimulus-response learning, ChAT interneurons, which are tonically active, exhibits a pause in firing within a few hundred milliseconds after the presentation of the conditioned stimuli (Aosaki et al., 1994; Kimura et al., 1984; Ravel et al., 1999). This pause response depends on learning and is seen with stimuli predicting both rewarding and aversive outcomes (Ravel et al., 1999). While the precise function of the pause response in ChAT interneurons remains to be elucidated at a behavioral level, it has been suggested to encode the salience of external stimuli and regulate local dopamine release in striatum. The neural mechanism underlying the pause has caused an extensive debate in the field. Several cellular mechanisms involving multiple sources have been proposed, including the contributions from the intrinsic cell membrane properties of ChAT interneurons, dopamine regulation or GABA co-release, and thalamic inputs with the involvement of an unidentified type of striatal GABAergic interneuron (English et al., 2012; Nelson et al., 2014; Schulz and Reynolds, 2013; Straub et al., 2014; Sullivan et al., 2008; Threlfell et al., 2012). The abovementioned mechanisms are not necessarily mutually exclusive, and each might actually contribute to the pause response to a different degree or under various conditions. In our study, we identified a novel extrastriatal GABAergic input from GPe to ChAT interneurons that is sufficient to suppress tonic firing and generate pause responses similar to those observed in behavior (Aosaki et al., 1994). Considering recent studies implying that striatum-projecting GPe neurons play a crucial role during action cancelling (Mallet et al., 2016), our current results thus further reinforce that the GPe to striatal interneuron projections may be an important part of the feedback circuitry involved in context-dependent action control. In this study, we identified a novel, functional excitatory PPN pathway that was selectively enriched in it projections to ChAT interneurons, but not SPNs. Previous literature suggested a significant anatomical cholinergic PPN input to striatum (Dautan et al., 2014). Co-release of glutamate from cholinergic terminals in striatum on ChAT interneurons may be one possible source of this excitatory signal. Yet, previous evidence does not lend strong support for the idea of co-release with a vast majority of cholinergic neurons in PPN lacking expression of vGluT2 mRNA (Wang and Morales, 2009). Alternatively, the lack of rabies labeling of cholinergic cells in PPN may be attributed to a technical limitation with rabies labeling of neuromodulatory synapses. For example, several striatal rabies tracing studies using the same technique do not find significant rabies labeling of dopamine neurons in the substania nigra pars compacta (SNc) (Smith et al., 2016; Wall et al., 2013), despite the dense innervation of dopamine terminals from the SNc in dorsal striatum. Alternatively, ChAT interneurons may not receive direct cholinergic projections from PPN. Additional, studies will be needed to address the role of two sources of acetylcholine from ChAT interneurons or PPN terminals in striatum and determine what, if any, crosstalk occurs on striatal interneurons. Our anatomical tracing data indicate that ChAT interneurons receive more projections from associative regions of cortex and thalamus (e.g. lateral orbital cortex, retrosplenial cortex, mediodorsal thalamus, etc.). Conversely, PV interneurons receive more inputs from sensorimotor regions, including primary motor and somatosensory cortical areas. These preferential inputs suggest a potential functional distinction for their role in controlling behavior, whereby ChAT interneurons may receive internal cognitive or external environmental information for context-dependent action modulation, while PV interneurons may integrate sensorimotor information for action learning and selection. Together, these data indicate a comprehensive revision of striatal circuitry with distinct, yet complimentary roles for striatal ChAT and PV interneurons in shaping striatal function. All procedures were approved by the Salk Institute Institutional Animal Care and Use Committee. Group housed male and female adult mice (8–12 weeks) were used in the study. Heterozygous ChAT-IRES-Cre (Chat) (Jackson Labs, stock # 006410, RRID:IMSR_JAX:006410) and PV-Cre (Pvalb) (Jackson Labs, stock # 008069, RRID:IMSR_JAX:008069) mice were backcrossed to C57Bl6/J (>9 generations). For G-deleted rabies mediated cell tracing, animals were anesthetized with ketamine/xylazine (100 mg/kg/10 mg/kg) and mounted on a stereotaxic device (Kopf Instruments; Tujunga, CA). The skull was leveled at bregma and lambda and a small hole was drilled at the dorsal central striatal coordinate of AP +0.5, ML −1.8. Only the right hemisphere was used for this study. A Hamilton syringe (33 gauge needle) containing freshly mixed AAV5-TVA-mCherry (3–4.3 × 1012 particles/mL; UNC Vector Core; Chapel Hill, NC, RRID: SCR_002448) and AAV8-CA-RG (1.2–4.3 × 1012 particles/mL; UNC Vector Core; Chapel Hill, NC, RRID: SCR_002448) (total 1 µl) was slowly lowered to a depth of DV −2.25 from the dura. The virus cocktail was injected slowly over 10mins. The needle was left in place for 5 min additional minutes and then the needle was slowly retracted over 5 min to reduce virus moving into the tract. Mice were sutured and returned to their home cage with ibuprofen (50 mg/kg/day) in their drinking water for four days. After three weeks to allow for maximal expression of helper viruses animals are injected with 1.5 µl of (EnvA) SAD-∆G Rabies-eGFP (1.6–6.55 × 108 particles/mL, Salk Vector Core, La Jolla, CA, RRID: SCR_014847) on an angle (18°) to avoid labeling any neurons in the initial injection tract in the same target region. Injection locations were identical in ChAT-Cre and PV-Cre animals suggesting that connectivity differences observed are attributable to interneuron target and not topography. A total of (6) ChAT-Cre and (5) PV-Cre mice (high input expression) were used in tracing experiments and included in analysis following a power analysis. These experiments were performed once and all brains (6 ChAT, 5 PV) were included in the analysis. Ten days after rabies injection mice were anesthetized with an overdose of ketamine/xylazine and transcardially perfused with 0.01M PBS (30–40 mL) followed by 4% paraformaldehyde (PFA)/0.1M PB pH 7.4 (30–40 mL) with a peristaltic perfusion pump (Cole Parmer; Vernon Hills, IL). The brain was carefully extracted and post-fixed in 4% PFA overnight (24 hr). The brain was then transferred to 30% sucrose/0.1M PB for 1–2 days until the brain equilibrated and sunk. The brain was then blocked with a brain matrix (Zivic Instruments; Pittsburg, PA) to obtain a true coronal plane and mounted on a freezing microtome. Additional ChAT-Cre and PV-Cre animals were cut in the sagittal plane to avoid missing any targets in rostral or caudal sites. Only neurons ipsilateral to the injection site were quantified. Coronal slices were collected at 50 µm resolution in 96 well plates containing cyroprotectant (0.1M phosphate buffer, ethylene glycol, glycerol) to maintain AP position. Every other brain slice was plated on super frost plus slides (Thermo Fisher Scientific, Waltham, MA) for a whole brain reconstruction at 100 µm resolution. Slides were counterstained with DAPI and cover slipped with aqua-poly mount mounting media (Polysciences, Inc; Warrington, PA). Slides were scanned on an automated slide scanner (Olympus VS120) at 10x in the blue and green channels. Images were batch converted to composite TIFFs and saved for image analysis. Individual channels were thresholded when necessary to better distinguish cells in densely expressing regions. Coronal mouse brain reference atlas images overlays were used from the Allen Mouse Brain Atlas (RRID: SCR_013286) (Website: © 2015 Allen Institute for Brain Science. Allen Mouse Brain Atlas [Internet]. Available from: http://mouse.brain-map.org) and made into to transparent overlays in Adobe Illustrator CS6 (San Jose, CA)(RRID: SCR_010279). De-identified images were placed in Adobe Illustrator CS6 and the proper AP coronal reference image was overlaid on the scanned brain slice. The reference image was warped to match slice boundaries and white matter anatomical landmarks at multiple points. Each cell soma in each brain region and cortical layer was counted and AP plane was recorded. Counters were blind to condition and were vetted with an inter-rater reliability of >95% when counting the same brain before analysis. To check the most rostral and caudal regions of the brain for expression additional mouse brains in the sagittal plane were analyzed. Total number of neurons minus striatal expression was used to determine the total number of input neurons to either ChAT or PV interneurons. All data is presented as the percent of total number of input neurons to normalize for difference in the number of neurons labeled from mouse to mouse. Higher order association cortex grouping included orbital, prelimbic, insular, cingulate, secondary motor cortex, secondary somatosensory cortex, retrosplenial and posterior parietal cortex. Sensorimotor cortex grouping included primary motor cortex, primary somatosensory cortex as well as sensory regions like auditory cortex and visual cortex. Cortical layer distribution was identified by overlaid brain atlas template aligned to corpus callosum and edge of cortex along with DAPI counter staining. Distinctive layer 4 DAPI staining was also used as a landmark to divide superficial or deep layer expression in certain cortical regions. For starter cell quantification six slices containing the rostral to caudal striatum and surrounding the injections site were immunostained with anti-mCherry (TVA) and anti-eGFP antibodies. Each image was bisected into dorsal medial and dorsal lateral striatum subdivisions. Total number of TVA-mCherry and rabies-eGFP colocalized starter cells were counted in image j. Data is presented as percent of total starter cells. Rabies-eGFP brain slices were washed 3x in 1X TBS (15 min/each) in net wells on an orbital shaker. Slices were blocked and permeabilized in TBS++ (3% normal horse serum (Jackson ImmunoResearch, West Grove, PA), 0.25% TritonX-100 in 1X TBS) for 1 hr at room temperature on a shaker. Primary antibodies (anti-PV mouse, 1:1000, P3088 (MilliporeSigma, St. Louis, MO; RRID: AB_477329); anti-PV rabbit, 1:1000, ab11427 (Abcam, Eugene, OR; RRID: AB_298032); anti-ChAT goat, 1:100, AB144P (MilliporeSigma, St. Louis, MO; RRID: AB_2079751); anti-NPAS1 rabbit, 1:500, GTX105876 (GeneTex; Irvine, CA; RRID: AB_424768); anti-mCherry mouse 1:100, 632543 (Takara Bio USA, Inc, Mountain View, CA; RRID: AB_2307319); anti-eGFP rabbit, 1:400, A11122 (Thermo Fisher Scientific, Waltham, MA; RRID: AB_1074875); anti-Somatostatin rabbit 1:300, NP106SST, (Protos Biotech Corp, New York, NY); anti-FoxP2 rabbit 1:1000, HPA000382, (Sigma; RRID: AB_1078908)) was diluted in TBS ++and incubated on a shaker at 4°C for 48 hr. Slices are washed 2x in 1X TBS (15 min/each) and 30 min in TBS++. Slices were then incubated in secondary antibody (donkey anti-mouse (RRID: AB_2340846, RRID: AB_2340813, RRID: AB_2340819) or donkey anti-rabbit (RRID: AB_2313584, RRID: AB_2307443, RRID: AB_2340607) or donkey anti-goat (RRID: AB_2336933, RRID: AB_2307351, RRID: AB_2340415) Cy2, Cy3 or Cy5, 1:250, (Jackson ImmunoResearch, West Grove, PA) for 2–3 hr at room temperature on an orbital shaker. Slices were washed three times in 1XTBS (15 min/each), transferred to 0.1M PB, plated on super frost plus slides and cover slipped with aquapoly mount mounting media. Images were collected on a Zeiss 780 confocal microscope with tiling capabilities. Orthogonal projections of the Z-plane of individual channels are presented. Colocalization analysis is performed in Fiji/ImageJ (RRID: SCR_002285). Briefly, individual channels are opened in Fiji/ImageJ and merged into a composite. The area of interest is isolated, brightness and contrast adjusted and individual channels are toggled on and off to determine colocalization with the cell counter tool. Total numbers of neurons in both channels are counted over multiple slices in the A-P axis using the cell counter tool and the number of neurons colocalized is reported as a percent of total eGFP neurons. TRN: PV-Cre mice between 10–16 weeks were anesthetized and placed in a stereotaxic frame. The skull was leveled at bregma and lambda and a mounted drill was used to create holes in the skull over the TRN and dorsal striatum based off bregma. A Hamilton syringe (33 gauge needle) was slowly lowered to the TRN (AP −0.58, ML +−1.25, DV −3.5) and 0.1 µl of AAV9-Ef1a-DIO-ChR2 (H134R)-eYFP (titer ~2×1012, Penn Vector Core; RRID: SCR_015406) was injected over 10 min. The needle was left in place for 5 min. With a different syringe 1 µl of AAV9-FLEX-tdTomato (titer ~2×1012, UNC Vector Core; RRID: SCR_002448) was injected into the dorsal striatum (AP +0.5, ML +−1.9, DV-2.25) to label PV interneurons in a PV-Cre mouse. The AAV9-FLEX-tdTomato was never observed in TRN. In an additional approach to validate TRN connectivity 0.5 µl of AAVretro-EF1a-Flp (UNC Vector Core; RRID: SCR_002448) is injected in dorsal striatum (AP + 0.5, ML +−1.9, DV-2.25) and during the same surgery 0.1 µl of AAV9-hsyn-Con-Fon-hChR2-eYFP (UNC Vector Core; RRID: SCR_002448) is injected in TRN (AP −0.58, ML +−1.25, DV −3.5). Additionally, Sst-IRES-Cre (Sst) (Jackson stock # 028864, RRID:IMSR_JAX:028864) mice were injected with AAV9-FLEX-eGFP in the TRN like previous. GPe: For GPe to ChAT and PV interneuron recordings 0.2 µl of AAV9-hsyn-ChR2-eYFP (Penn Vector Core; RRID: SCR_015406) was injected in the GPe (AP −0.46, ML +−1.9, DV −3.3) similar to above. 1 µl of AAV9-FLEX-tdTomato (titer ~2×1012, UNC Vector Core; RRID: SCR_002448) was injected into the dorsal striatum (AP +0.5, ML +−1.8, DV-2.25) of a ChAT-Cre or PV-Cre mouse to identify ChAT and PV interneurons, respectively. PPN: For validation of PPN to striatal interneuron connectivity we injected a small volume (0.1 µl) of AAV9-hsyn-ChR2-eYFP in PPN (AP −4.48, ML +−1.1, DV −3.2) (Penn Vector Core; RRID: SCR_015406) and then injected 1 µl of AAV9-FLEX-tdTomato (AP +0.5, ML +−1.9, DV −2.25) (UNC Vector Core; RRID: SCR_002448) in the striatum in a ChAT-Cre or PV-Cre animal to identify ChAT and PV interneurons. Two weeks following AAV injection, mice are anesthetized with ketamine/xylazine and transcardially perfused with ice cold, bubbling (95% O2/5% CO2) NMDG cutting solution [consisting of (in mM): NMDG 105, HCl 105, KCl 2.5, NaH2PO4 1.2, NaHCO3 26, Glucose 25, Sodium L-Ascorbate 5, Sodium Pyruvate 3, Thiourea 2, MgSO4 10, CaCl2 0.5, 300mOsm, pH = 7.4]. The brain is blocked coronally or sagittally with a brain matrix (Zivic Instruments; Pittsburg, PA) and acute coronal/sagittal slices (300 µm) were cut on a vibratome (VT1000S, Leica Microsystems; Buffalo Grove, IL) through the striatum in ice cold, bubbling NMDG based cutting solution. Slices were allowed to recover for 15 min at 32°C in bubbling NMDG cutting solution. Slices were then transferred to a holding chamber consisting of normal ACSF [consisting of (in mM): NaCl 125, KCl 2.5, NaH2PO4 1.25, NaHCO3 25, D-Glucose 12.5, MgCl2 1, CaCl2 2, pH = 7.4, 295 mOsm] at 28°C. After at least one hour of recovery the slices were placed in a chamber and aCSF was perfused over the slices at ~2 mL/min. PV (+) cells were visualized under IR- DIC optics (Ziess Axioskop2; Oberkocken, Germany) at 40x and confirmed to express tdTomato with brief confirmation in the epifluorescent channel. In some experiments neighboring PV (-) neurons (putative SPNs) were patched. Voltage clamp (28°C) or current clamp (33°C) recordings were made from PV-tdTomato (+) interneurons in the dorsal striatum (~+0.5 mm bregma). 3–4 MΩ patch pipettes (WPI; Sarasota, FL) were pulled from borosilicate glass on a P-97 pipette puller (Sutter Instruments; Novato, CA) and filled with internal solution consisting of (in mM): KMeSO4 135, KCl 5, CaCl2 0.5, HEPES 5, EGTA 5, Mg-ATP 2, Na-GTP 0.3, pH = 7.3, 305mOsm) for current clamp studies. For PV voltage clamp studies to examining TRN connectivity IPSCs were isolated with a high Cl- based internal solution consisting of (in mM): CsCl 120, CsMeSO3 15, NaCl 8, HEPES 10, EGTA 0.5, QX-314 5, Mg-ATP 2, Na-GTP 0.3, pH 7.3, 305mOsm. Following five minutes post break in paired light pulses (473 nm, 5–25 mW/mm2, 2.5 ms, 50 ms ISI) were delivered through a 200 µm glass fiber optic (Thor Labs; Newton, NJ) positioned close to the recorded cell (50–150 µm) at 0.05 Hz using a 473 nm blue DPSS laser system (Laserglow Technologies, Toronto, ON). Twenty sweeps (0.05 Hz) were collected to determine latency and CV. The cell was held at −70 mV and light evoked currents are collected after bath application of 10 µM NBQX and 50 µM DL-APV (MilliporeSigma, St. Louis, MO) to block AMPAR and NMDAR-mediated transmission, respectively. IPSCs were collected 8–10 min following the wash in of drugs. 50 µM-100µM picrotoxin (MilliporeSigma, St. Louis, MO) was added to the bath to block fast GABAAR transmission and confirm IPSC. Series resistance was initially compensated and monitored continuously throughout the experiment and the data were rejected if the parameters changed by more than 20% over the duration of the recording. For ChAT, PV and SPN IPSC voltage clamp studies Cs+ methanesulfonate internal solution consisting of (in mM): CsMeSO3 (120), NaCl (5), TEA-Cl (10), HEPES (10), QX-314 (5) EGTA (1.1), Mg-ATP (4), Na-GTP (0.3), pH = 7.2–7.3, 305mOsm paired with holding the cell at −10 mV. Light evoked (473 nm, 5–25 mW/mm2, 2.5 ms, 50 ms ISI) IPSCs are collected in the presence of 10 µM NBQX and 50 µM DL-APV to block AMPAR and NMDAR-mediated transmission, respectively. 50 µM-100µM picrotoxin was added to the bath to block fast GABAAR transmission and confirm IPSCs. Pairs of ChAT-Cre tdTomato positive or PV-Cre tdTomato positive and neighboring tdTomato negative putative SPNs (<100 µm) are recorded from the same slice. For PPN connectivity experiments Cs + methanesulfonate internal is used like above. Pairs of ChAT and SPN (<100 um) are used for connectivity probability. A cell is considered connected if it has a visible, reliable current (20 sweeps, 0.05 Hz) with onset latency less than 6 ms post laser on. Excitatory and inhibitory currents are determined following wash on of AMPAR/NMDAR antagonists and GABAAR antagonists, respectively. Voltage-clamp recordings were performed using a Multiclamp 700A (Molecular Devices; Sunnyvale, CA), digitized (Digidata 1440; Molecular Devices; Sunnyvale, CA) at 10 kHz and filtered at 2 kHz. For GPe current clamp studies a potassium methane sulfonate internal solution is used. To avoid run down of spiking in ChAT interneuron in whole cell current clamp mode recordings were collected in the first 15 min following break in or in loose patch configuration. Three second threshold current injections (+150–350 pA) were given to drive the PV neuron to fire consistent APs. On interleaved trials 1 s constant or 20 Hz blue light stimulation (473 nm, 5–10 mW/mm2) was given to activate GPe ChR2 (+) fibers in the striatum and spiking inhibition was quantified over many sweeps. Perievent time histograms (PETH) are constructed, aligned to laser on and smoothed in MATLAB (Natick, MA). Average spiking during one second stimulation or control (no laser) are compared. Rebound window (1.8–2.9 s average following laser on) is used for rebound statistics. Current clamp recordings were filtered and digitized at 10 kHz and collected with pClamp 9 (Molecular Devices; Sunnyvale, CA; RRID: SCR_011323). Data was analyzed with Clampfit nine and custom MATLAB (RRID: SCR_001622) scripts (see source code MATLAB file). Striatal neurons were recorded as previously described (Jin et al., 2014). Briefly, mice were lightly anesthetized using isoflourane (4% induction; 1–2% sustained) and were placed in a stereotactic frame. For electrophysiological recording, we utilized electrode arrays (Innovative Neurophysiology Inc.; Durham, NC) of 16 tungsten contacts (2 × 8) that were 35 µm in diameter. Electrodes were spaced 150 µm apart in the same row and 200 µm apart between two rows. Total length of electrodes was 5 mm. Each array with an optic fiber directly attached was employed. The tip of the fiber was ~200 µm away from the tips of the electrodes and the optic fiber was firmly fixed to the array for the duration of each recording session. Array targeting dorsal striatum (+0.5 AP,±1.5 ML, - 2.0 ~ 2.2 DV) was incrementally lowered into dorsal striatum. Silver grounding wire was attached to skull screws. Neural activity was recorded using the MAP system (Plexon Inc.; Dallas, TX). The spike activities were initially online sorted with a built-in algorithm (Plexon Inc., Dallas, TX). Only spikes with stereotypical waveforms clearly distinguished from noise and with relatively high signal-to-noise ratio were tagged and saved for further analysis. After the recording session, the recorded spikes were further isolated into individual units by an offline sorting software (Offline Sorter, Plexon Inc, Dallas, TX). Each individual unit displayed a clear refractory period in the inter-spike interval histogram, with no spikes during the refractory period (larger than 1.3 ms). To optogenetically stimulate GPe or TRN terminals within striatum, we injected non-floxed version of AAV-ChR2 virus (0.2 µl of AAV9-hsyn-ChR2-eYFP, Penn Vector Core) into the GPe (AP −0.46, ML + −1.9, DV −3.3) or a Cre-dependent AAV-ChR2 in a PV-Cre mouse for TRN (AP −0.58, ML + −1.25, DV −3.5) (0.1 µl of AAV9-Ef1a-DIO-ChR2(H134R)-eYFP, Penn Vector Core) (titer ~2×1012). For each recording session, blue laser stimulation was delivered through the optic fiber from a 473 nm laser (Laserglow Technologies, Toronto, ON) via a fiber-optic patch cord, and the neuronal responses were simultaneously recorded. The stimulation patterns included 1 s constant light and 20 or 50 Hz (10 ms pulse width, 20 or 50 pulses in 1 s). The inter-stimulation interval was 4 s and each stimulation pattern was repeated for 30 trials. The laser power was adjusted carefully (~3.0–5.0 mW) to drive reliable response. Statistics were conducted in Graph Pad Prism 6.01 (La Jolla, CA; RRID: SCR_002798). Student two-tailed t-test or non-parametric Mann Whitney U Test was conducted when distributions significantly deviated from normal distributions. Two-way ANOVA with Sidak’s multiple comparisons correction was used to analyze whole brain input regions and cortical layer distributions. Frontiers in Systems Neuroscience 7:47. The Journal of Neuroscience 14:3969–3984. Brain Structure and Function, 7, 10.1007/s00429-017-1536-6. Frontiers in Systems Neuroscience 5:45. The Journal of Neuroscience 18:9438–9452. Current Opinion in Neurobiology 30:59–65. 223–241, Muscarinic modulation of striatal function and circuitry, Handbook of Experimental Pharmacology. Journal of Comparative Neurology 521:2502–2522. European Journal of Neuroscience 38:2382–2388. The Journal of Comparative Neurology 515:397–408. The Journal of Neuroscience 17:2477–2491. The Journal of Neuroscience 22:8158–8169. Frontiers in Cellular Neuroscience 7:55. Current Opinion in Neurobiology 33:182–187. European Journal of Neuroscience 29:340–358. Thank you for submitting your article "Differential inputs to striatal cholinergic and parvalbumin interneurons manifest functional distinctions" for consideration by eLife. Your article has been reviewed by three peer reviewers, and the evaluation has been overseen by a Reviewing Editor and a Senior Editor. The following individuals involved in review of your submission have agreed to reveal their identity: Thomas A Stalnaker (Reviewer #1); Jesus Bertran-Gonzalez (Reviewer #3). This manuscript utilizes an array of techniques including viral tracing, genetics, and electrophysiology to characterize the inputs to and potential functional roles of the parvalbumin and cholinergic striatal interneurons. Identifying the distinct circuits and potential roles of these two striatal compartments is an important and long-standing question in systems neuroscience, and the current experiments were judged to be a valuable addition to this work. While all three reviewers appreciated the sheer amount and also the high quality of much of the data, they also felt that overall the paper came across as somewhat inconclusive or unfocused. On discussion, it was generally agreed that this was due to the lack of consistency in the behavioral approaches and the results. In contrast to the anatomical and ex vivo electrophysiological data, the behavioral experiments tended to suffer from major weaknesses (inconsistent designs, lack of opto controls, use of primarily excitatory methods, non-physiologic parameters) that made their interpretation difficult and/or there were inconsistencies across experiments that were difficult to resolve. These issues are evident across the reviews. While the authors may feel that these can all be resolved, the consensus of the reviewers was that the paper would be much better if it were refocused on the anatomical comparisons, with the behavioral results removed. This change, along with some adjustments to the comparisons (point #2, reviewer #3), were judged to be the essential revisions. We realize this is a large change, but if the authors are willing to do this, the reviewers felt a revision would be worthwhile. This manuscript presents a wide array of experiments whose overarching object is to characterize the inputs to and functional roles of parvalbumin (PV) and cholnergic (CIN) striatal interneurons. The experiments are technically sophisticated and the results are very thoroughly and clearly reported. There is a veritable mountain of interesting data in this manuscript. The anatomical tracing results are especially valuable and important. The one general weakness is that the functional experimental results are suggestive rather than constituting solid tests of the hypotheses in question. Below, I will try to specify what I mean. However, in spite of this weakness, I think that the data taken together, particularly the anatomical data, are of such importance and so thoroughly presented that the manuscript should be published with only minor revisions. 1) I don't think that the functional data regarding the thalamic reticular nucleus inputs to PV neurons say very much. Here the authors stimulated these inputs in freely moving mice and found that locomotion was increased. However, there is no way to tell what this might mean. In the Discussion, this result is linked to a role for this input in modulation of attention, biasing action selection, and coordinating sensory attention and action. But really the result does not provide evidence supporting any of those ideas one way or the other. 2) The external segment of the globus pallidus inputs onto CINs are suggested to be involved in generating CIN pauses and possibly in reinforcement learning. But pause-like responses occur when these inputs are stimulated continuously for nearly a second, which is unlikely to be a physiologically relevant mechanism. The authors also show that mice will learn to push a lever to stimulate these inputs and in a separate experiment to inhibit CINs. These results are interesting and suggestive. However, the latter effect is only about one tenth the magnitude of the former effect, suggesting that some other mechanism besides inhibiting CINs must be in play. I think the authors should comment on the disparity between the magnitude of these two results. What other mechanism (besides inhibition of CINs) might account for the highly robust self-stimulation of these inputs? 3) The behavioral effects of ablating CINs or PV neurons are suggestive and interesting, but again I think the conclusions reached are far from clearly supported. The PV-ablation effect on operant learning is very convincing. However, this does not seem consistent with what others have suggested in regard to PV neurons – e.g. a role in action selection. Can the authors clarify whether their data shed any light on why PV-ablation results in such an enormous learning deficit? In the case of the CIN-ablation effect on the go/no go task, can the authors shed any additional light on why they interpret this as a deficit in context-dependent control of actions? Under this interpretation, why would the effect on baseline responding appear on day 1, before any learning of context has occurred in control mice? Wouldn't an alternative interpretation be that these rats have an unconditioned increase in food-elicited hyper-activity that they slowly learn to suppress? a) They should clarify how many mice contributed to the rabies tracing experiment (sorry if I missed this), and where the placements were located. How did the authors confirm that the initial infusions of virus took place in identical locations in the PV-cre vs. Chat-cre mice? Furthermore, are there any data in this experiment speaking to whether associative cortical inputs to CINs occur more in the dorsomedial locations in striatum or sensorimotor inputs to PV neurons occur more in dorsolateral locations? The authors show that overall the number of originator neurons in dorsomedial vs. dorsolateral are similar, but doesn't that proportion vary in each brain, and if so, wouldn't that shed some light on my question? b) Can the authors comment on why they might have found that the pedunculopontine inputs to striatum are not cholinergic, in contrast to previously published data? In this manuscript Klug et al. use viral tracing, genetics, and electrophysiology to map the inputs to parvalbumin (PV) and cholinergic (ChAT) interneurons in the dorsal striatum. They identify some previously unknown or underappreciated inputs, particularly the TRN input to PV interneurons, which will be of interest to the basal ganglia field. I found the input tracing part of their study (Figures 1, 2, 3, 6, and accompanying supplementary figures) compelling, novel, and believe it deserves to be published in eLife. The authors also use optogenetics to examine the function of three prominent inputs to PV or ChAT cells: a previously unknown GABAergic projection from the thalamic reticular nucleus, a projection from GPe, and a projection from the pedunculopontine nucleus. While I applaud the authors' intentions and recognize the huge effort that went into these experiments, I felt that these behavioral experiments were not well designed because there were some big inconsistencies in behavioral tasks, and the controls were sometimes not defined or poorly chosen. Additionally, in my reading the cell ablation study at the end seems to contradict some of the optogenetics results. For example, in Figure 4 they show that activating the GABAergic TRN projection to striatum-which preferentially targets PV cells-increases distance traveled. But in Figure 7 they show that genetically ablating PV cells doesn't affect distance traveled but it does affect time in center of arena (a measure of anxiety). Not only do these results seem contradictory, but the data the authors choose to plot in Figures 4 and 7 are inherently different. I was also confused why the authors used an ICSS task in Figure 5, but a food reward task in Figure 7. I also had a hard time finding information about number of animals or how the control experiments were designed. There were also few if any GFP or YFP control experiments for the optogenetics part. Finally, the authors over-relied on optogenetic excitation of different inputs, which raises the concern about showing sufficiency not necessity. I don't think the manuscript in its current form can be published without major changes to the behavioral experiments, or elimination of the behavioral experiments section altogether and publication of just the input tracing part. This study gathers an impressive range of techniques and presents a comprehensive anatomical, physiological and behavioural dataset aimed at determining the specific circuitry controlling cholinergic (ChAT) and parvalbumin (PV) interneurons of the striatum. The authors start by identifying, at the whole-brain scale, the immediate circuitry inputting each interneuronal system through retrograde trans-synaptic tracing, which then use to confirm some of the suggested circuitry and, more importantly, identify previously unrecognised projections. The authors go on and characterise three of these new circuits (TRN to PV, GPe to ChAT and PPN to ChAT) and also conduct confirmatory behavioural experiments whereby each interneuronal subpopulation is selectively ablated using toxicogenetics. Overall this study is excellent and will significantly contribute to this field of research. 1) The finding that the same number of starter cells are present in the two Cre lines is puzzling (Figure 1—figure supplement 2E-G). Does this mean that the actual density is the same in both populations? This contrasts with the view that PV neurons are more frequent than ChAT neurons in the dorsal striatum. Perhaps it would be worth contrasting those numbers with those obtained in WT mice, just to rule out that Cre expression does not limit the proliferation of any of the two populations, as seems to be happening in certain lines (e.g. Harno et al. Cell Metabolism, 2013, 18 (1); 21-28). This is only a suggestion that might help reconciling with previous literature. 2) In many instances in the paper, the percent of total inputs to PV and ChAT interneurons is statistically compared across the two systems side by side (e.g. Figure 1—figure supplement 2F-G; Figure 2B-F; Figure 3A-C; Figure S4A-L; Figure 4—figure supplement 1A). I am unsure about the validity of this comparison. To me, even if the number of starter neurons is similar and the area is matching, these two subpopulations form entirely different systems with very dissimilar physiological and morphological characteristics (e.g. Kawaguchi, JNeurosci, 1993,13(11); 4908-23). Features like dendritic arborisation, synaptic density and overall cellular volume may influence to a large extent the efficiency of trans-synaptic infection, therefore providing a very different pattern of labelling in circuits inputting onto PV and ChAT neurons. While this provides very valuable information on the relative proportion of afferent projections from diverse brain regions to each interneuronal system separately, I fail to see how comparing across the two systems is informative. Thus, claims such "ChAT neurons received significantly more inputs from the associative cortex than PV neurons" would be misleading. I think that all data should be presented (and statistical comparisons done) in each system separately-comparisons like "ChAT neurons received significantly more inputs from associative than sensorimotor cortices whereas PV neurons showed the opposite trend" would be appropriate. This would also reduce the amount of statistical comparisons, and would allow using within-subjects analyses which can be more powerful. 3) In the TRN study (subsection “Different thalamic projections to striatal ChAT vs. PV interneurons”, second paragraph), it is not immediately evident that parvalbumin and somatostatin staining inform about the anatomical boundary of the TRN, while this is a critical point in later viral manipulations (i.e. Figure 3A). It would be helpful to clarify this a bit more in the text, perhaps providing citations that describe the PV and SOM markers in TRN. 4) While the full characterisation of the transgenic lines presented at the very start of the paper is appreciated, I find that some viral spread and/or multielectrode placement confirmation may be lacking in some of the in vivo experiments. For example the TRN and GPe multielectrode/optogenetics experiments (Figure 4, Figure 3—figure supplement 3, Figure 5, Figure 4—figure supplement 2) do not have placement verifications. Adding a diagram with the locations in each experimental animal could be helpful. 5) The toxicogenetics experiments seem very clean and are a very good option to expose the role of each interneuronal system in action control. In the case of ChAT ablation, the authors did not find any deficit in the initial acquisition of instrumental behaviours (Figure 7), and they found an increase of baseline lever-pressing rate which had no consequence on later stimulus-response learning. The authors argue that these data support that ChAT interneurons play a role in providing context to the modulation of action. However, I think that it is difficult to reach this conclusion with the data presented in this paper, although other studies could be mentioned to support it. It would be important to discuss the results in Matamales et al., 2016, where authors performed a very similar DTR-induced ablation of ChAT neurons in the dorsal striatum of mice, and they too studied its effects on action control. In that study it was also found that there was no change in the establishment of initial instrumental contingencies, but the ChAT-depleted mice were unable to update these contingencies upon reversal. This paper is relevant and supports the role of ChAT neurons in contextual modulation of action. 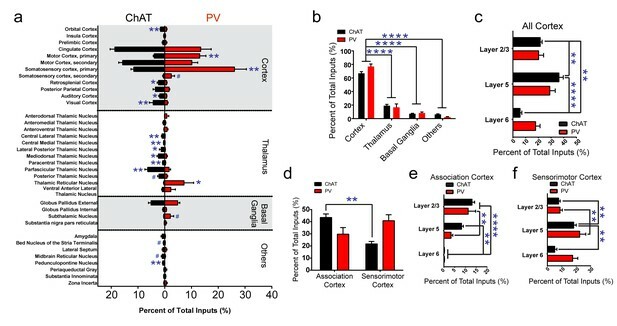 6) On the other hand, the authors found that PV ablation dramatically impaired instrumental behaviours (Figure 7K), and also reported that these mice show virtually no sensitivity to stimuli. However, would the primary impairment in instrumental learning not preclude performance during the go/no go test? Can the conclusion "PV interneurons are important for stimulus-response associations" be formulated if animals show very limited instrumental capacity? This is perhaps worth discussing a bit. 7) Figure 8F is not referred to in the text. 1) We have removed all behavioral data including TRN terminal stimulation locomotion and accelerometer data (Figure 4), ICSS data (Figure 5), and ChAT and PV diphtheria-mediated ablation data (Figures 7 and 8), as well as three supplemental figures including cortical layer breakdown by cortical subregion (Supplementary Figure 4) and two diphtheria-mediated lesion behavior supplementals (Supplementary Figures 9 and 10). 2) All statistical comparisons between ChAT and PV including main Figures 2, 3, 4 and Supplementary Figure 4 are removed (except for Figure 2A, see the explanation below) and we have emphasized only the within-ChAT or PV comparisons throughout the results. 3) We have extensively revised the manuscript from the title to Discussion to integrate all of the changes mentioned above. 4) We have added images of parvalbumin and somatostatin staining of TRN to address the reviewer’s concern on the expression of parvalbumin and somatostatin neurons in TRN (Figure 3—figure supplement 1E, F). 5) We have added a new supplementary figure to address in vivo recording array placement (Figure 3—figure supplement 2). 6) We have added within group laminar cortical statistical comparisons (Results, subsection “Monosynaptic tracing reveals the inputs to striatal ChAT and PV interneurons”, last paragraph) and added some commentary on the similarities in the inputs of cortical laminar organization between interneuron and striatal D1-/D2- or patch-/matrix-projection neurons in associative and sensorimotor cortex (Discussion, subsection “Differential excitatory inputs to ChAT and PV striatal interneurons” last paragraph). 7) We have added a new paragraph to the discussion on the PPN excitatory inputs to ChAT interneurons comparing and contrasting against known PPN cholinergic inputs to striatum (Discussion, subsection “An excitatory pedunculopontine nucleus input to striatal ChAT interneurons” first paragraph). We hope the reviewers now find that these revisions have addressed all the concerns and the manuscript is now suitable for publication in eLife. […] 1) I don't think that the functional data regarding the thalamic reticular nucleus inputs to PV neurons say very much. Here the authors stimulated these inputs in freely moving mice and found that locomotion was increased. However, there is no way to tell what this might mean. In the Discussion, this result is linked to a role for this input in modulation of attention, biasing action selection, and coordinating sensory attention and action. But really the result does not provide evidence supporting any of those ideas one way or the other. Thank you for the comment. Our intention was simply to functionally validate the inhibitory TRN projection to striatal PV interneuron in freely moving animals. We found stimulation of TRN terminals in striatum facilitates locomotion. Following the reviewer’s suggestion, however, we have now removed that figure and all the TRN behavioral data from the manuscript. 2) The external segment of the globus pallidus inputs onto CINs are suggested to be involved in generating CIN pauses and possibly in reinforcement learning. But pause-like responses occur when these inputs are stimulated continuously for nearly a second, which is unlikely to be a physiologically relevant mechanism. We thank the reviewer for the feedback on the stimulation parameters for GPe terminal stimulation. The 1-s stimulation duration was initially chosen because we found that it is efficient for supporting ICSS learning behavior. While we agree that 1-s constant terminal stimulation is not necessarily physiologically relevant, we would like to point out that inhibition of tonic firing in ChAT and PV occurs within the first tens of milliseconds following laser on. We have confirmed that this is the case for suppressing tonic basal firing in ChAT with fast latency in both ex vivo brain slice (Figure 4D, E and Figure 4—figure supplement 2H, I) and in in vivo recordings (Figure 4J). We have now removed the ICSS behavioral data based on reviewers’ suggestions and left only the electrophysiological data in Figure 4. The authors also show that mice will learn to push a lever to stimulate these inputs and in a separate experiment to inhibit CINs. These results are interesting and suggestive. However, the latter effect is only about one tenth the magnitude of the former effect, suggesting that some other mechanism besides inhibiting CINs must be in play. I think the authors should comment on the disparity between the magnitude of these two results. What other mechanism (besides inhibition of CINs) might account for the highly robust self-stimulation of these inputs? We thank the reviewer for the comment. We agree with the reviewer and have stated in the main text that direct ChAT inhibition only partially recapitulates the effects of GPe terminal stimulation in striatum in terms of ICSS magnitude. It is possible that GPe terminal stimulation inhibits many different striatal neurons including various interneurons and SPNs, and this inhibition works in concert with possible dopamine release evoked by ChAT interneuron rebound activity through nAChR on dopamine terminals (Cragg, 2006) for supporting ICSS behavior. In comparison, direct inhibition of ChAT interneurons will be restricted to a rather small number of ChAT cells due to the sparse distribution of ChAT interneurons in dorsal striatum (1-2%) and limited spread of light. However, we have decided to remove the ICSS dataset from the manuscript per the reviewers’ suggestion. 3) The behavioral effects of ablating CINs or PV neurons are suggestive and interesting, but again I think the conclusions reached are far from clearly supported. The PV-ablation effect on operant learning is very convincing. However, this does not seem consistent with what others have suggested in regard to PV neurons – e.g. a role in action selection. Can the authors clarify whether their data shed any light on why PV-ablation results in such an enormous learning deficit? Thank you for the comment on the PV ablation data. We agree that striatal PV interneurons have been found to play a role in action selection (Gage et al., 2010). However, recent studies have expanded this role and suggested that striatal PV interneurons might be important in associative learning (Lee et al., 2017; Owen et al., 2018), consistent with what we found in our study. Nevertheless, we have removed the PV-ablation behavioral data from the manuscript according to the reviewers’ suggestion. In the case of the CIN-ablation effect on the go/no go task, can the authors shed any additional light on why they interpret this as a deficit in context-dependent control of actions? Under this interpretation, why would the effect on baseline responding appear on day 1, before any learning of context has occurred in control mice? Wouldn't an alternative interpretation be that these rats have an unconditioned increase in food-elicited hyper-activity that they slowly learn to suppress? We thank the reviewer for this comment. In our ChAT ablation data, rates of lever pressing are comparable between controls and lesion mice over seven days of continuous reinforcement (CRF) training. However, the difference of increased baseline press rate and magazine headentry rate in ChAT lesion versus controls appears on the first day of Go/No-Go training. We have now removed the ChAT and PV cell ablation behavioral data from the manuscript based on the reviewers’ suggestion. a) They should clarify how many mice contributed to the rabies tracing experiment (sorry if I missed this), and where the placements were located. How did the authors confirm that the initial infusions of virus took place in identical locations in the PV-cre vs. Chat-cre mice? We apologize for the confusion. We have moved the number of animals included in the rabies tracing earlier in the Results section and in the Materials and methods section. ChAT (N = 6) and PV (N = 5) mice were used in the rabies tracing experiments (Results, subsection “Monosynaptic tracing reveals the inputs to striatal ChAT and PV interneurons”, second paragraph; Materials and methods, subsection “Delta G-Rabies Tracing Viral Injections”). The coordinates and details for helper and rabies injections are found in the Materials and methods section under the header “Delta G Rabies Tracing Viral Injections”. The coordinates used were AP +0.5, ML -1.8, DV -2.25 to target dorsal central striatum. ChAT-Cre and PV-Cre mice were stereotaxic injected using the same coordinates and volumes of virus following a precise levelling of the skull in respect to bregma and lambda. Mice from both groups were injected within the same day. Rabies expression throughout dorsal striatum was confirmed in all brains prior to whole-brain cell counting and only included in the analysis if starter cells were contained within the dorsal striatum (see Figure 1—figure supplement 2 for example of starter cell confirmation and lack of cortical expression in negative controls). Furthermore, are there any data in this experiment speaking to whether associative cortical inputs to CINs occur more in the dorsomedial locations in striatum or sensorimotor inputs to PV neurons occur more in dorsolateral locations? The authors show that overall the number of originator neurons in dorsomedial vs. dorsolateral are similar, but doesn't that proportion vary in each brain, and if so, wouldn't that shed some light on my question? In all of our rabies-injected brains, the AAV helper injections covered a vast majority of the dorsal striatum that unfortunately limits our ability to disambiguate dorsal medial and dorsal lateral tracing to ChAT or PV interneurons. Our goal was to recruit as many starter cells as possible given that the interneuron types only make up roughly 1% of the total striatal neuron population. An additional complication for this quantification is the fact that striatal subdivisions are a gradient (ventral medial to dorsal lateral) defined more by the inputs then sharply demarcated territories with well-defined boundaries (Voorn et al., 2004). While there was variance in the number of starter cells, in our experiments the distribution of starters was similar across dorsal medial and dorsal lateral territories (Figure 1—figure supplement 2, determined with a simple bisecting line between dorsal medial and dorsal lateral striatum). We thank the reviewer for this question. Our data does not preclude the existence of a cholinergic input from the PPN to striatum that has been previously reported in rats (Dautan et al., 2014). The lack of rabies labeled cholinergic neurons in this study using mice may potentially be due to a technical limitation with rabies tracing of neuromodulatory inputs because of their non-conventional synapses. For example, several striatal tracing studies using the same technique do not find significant rabies labeling of dopamine neurons in the substantia nigra pars compacta (SNc) (Smith et al., 2016; Wall et al., 2013), despite the SNc densely innervating the dorsal striatum. We assume that one reason could be that cholinergic projections from PPN may not label well with the rabies transsynaptic tracing system. Alternatively, the PPN cholinergic projection may not synapse directly on striatal ChAT interneurons. The selectivity of this system may give some hints as to why there are at least two sources of acetylcholine in striatum. We have added a paragraph in the Discussion to address these points (subsection “An excitatory pedunculopontine nucleus input to striatal ChAT interneurons”, first paragraph). […] The authors also use optogenetics to examine the function of three prominent inputs to PV or ChAT cells: a previously unknown GABAergic projection from the thalamic reticular nucleus, a projection from GPe, and a projection from the pedunculopontine nucleus. While I applaud the authors' intentions and recognize the huge effort that went into these experiments, I felt that these behavioral experiments were not well designed because there were some big inconsistencies in behavioral tasks, and the controls were sometimes not defined or poorly chosen. Additionally, in my reading the cell ablation study at the end seems to contradict some of the optogenetics results. For example, in Figure 4 they show that activating the GABAergic TRN projection to striatum-which preferentially targets PV cells-increases distance traveled. But in Figure 7 they show that genetically ablating PV cells doesn't affect distance traveled but it does affect time in center of arena (a measure of anxiety). Not only do these results seem contradictory, but the data the authors choose to plot in Figures 4 and 7 are inherently different. We apologize for the confusion on the behavioral data. Our intention was to assign some functional behavioral relevance to the brain-wide inputs to striatal interneurons. We thank the reviewer for the pointing out the possible inconsistency on the role of PV interneurons and the locomotion. One possible reason underlying this difference is the different time course of inhibition vs. ablation, which may play an important role in determining the final behavioral outcome. 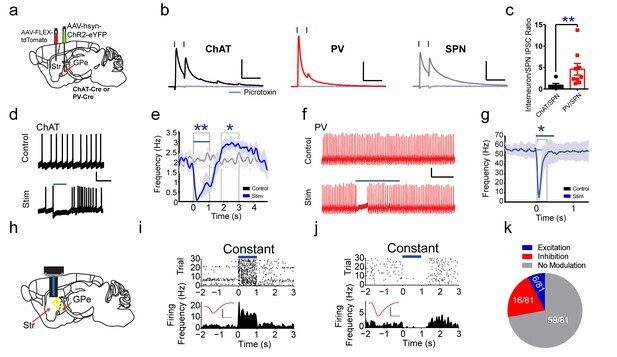 TRN facilitation of locomotion (potentially via inhibition of PV interneurons) occurs on the order of seconds, while PV cell ablation evolves over the course of weeks that might allow circuit-level compensation to occur. In regards to the differences in plotting the data in Figures 4 and 7, we intended to use accelerometer which samples at 1kHz, much faster than video tracking, to show transient locomotion initiations. Nevertheless, we have responded to the reviewers’ suggestions by removing all behavioral data in the manuscript. I was also confused why the authors used an ICSS task in Figure 5, but a food reward task in Figure 7. I also had a hard time finding information about number of animals or how the control experiments were designed. Sorry for the confusion on the choice of behavioral tasks. Our intention in choosing an ICSS task in the previous Figure 5 was due to the fact that optogenetic GPe terminal stimulation was sufficient to initiate a pause-rebound firing pattern in ChAT interneurons. Given the literature on acetylcholine-mediated dopamine release from dopamine terminals in striatum (Sulzer et al., 2016), we hypothesized that GPe terminal stimulation may trigger dopamine release as well. However, we have responded to the reviewer’s concerns by removing all behavioral data in the manuscript. There were also few if any GFP or YFP control experiments for the optogenetics part. Finally, the authors over-relied on optogenetic excitation of different inputs, which raises the concern about showing sufficiency not necessity. While we did not include eGFP/eYFP controls in our locomotion studies, we agree with the reviewer that they are excellent controls for the effects of laser stimulation and the effect of light cue on behavior. However, we did use 5Hz optogenetic laser stimulation serving as a within animal control for laser stimulation in that particular experiment. We did not observe any significant changes in locomotion following 5Hz stimulation versus preceding baseline. Also, we have gone to great lengths to shield the light at the ferrule to optic fiber connection to avoid a visual laser light cue. We agree with the reviewer that in order to demonstrate the necessity besides sufficiency for different inputs, it would require optogenetic inhibition experiments, which in many cases might be harder to conduct due to the distributed input cells. Nevertheless, based on the reviewers’ suggestion, we have now removed all the behavioral data from the manuscript to keep it more focused. Thank you for the suggestion. We have now removed all of the behavior from the manuscript and re-focused on the rabies-mediated monosynaptic tracing and functional electrophysiological dissection as you advised. We thank the reviewer for the suggestion regarding the number of starter cells. Differences have been observed via stereological cell counting in the literature in the number of ChAT and PV interneurons observed in dorsal striatum. Yet, those numbers have varied from study to study and are also dependent on species (Oorschot et al. 2013). While the absolute number is up for debate the overall comparison between the number between ChAT and PV is more similar than different. Unbiased stereological cell counts of immunostained striatum suggest minimum estimates of 1-2% of ChAT interneurons versus 0.7% of PV interneurons (Luk and Sadikot, 2001; Rymar et al., 2004). Yet others have found estimates of 0.43% ChAT interneurons versus 0.59% PV interneurons in the rat dorsal striatum (Oorschot et al. 2013). The total counts we obtained of immunostained ChAT and PV interneurons in dorsal striatum was not significantly different (average number of immunopositive neurons per brain slice in striatum, N=7 per group, taken from 10 brain slices (40µm thick) spanning the injection site; ChAT 207.6 ± 12.63, PV 170.7 ± 47.46; two-tailed unpaired t-test, p = 0.8048. Given the similar counts of interneurons, the fact we find a comparable number of starter cells seems consistent. We thank the reviewer for the question regarding the validity of the anatomical comparison between percent of total inputs to ChAT versus PV interneurons. While we agree with the reviewer and acknowledge the differences in dendritic arborization, synaptic density and overall cellular volume between the two interneuron types, the side-by-side comparisons we conducted have been following a common practice in the field in which many researchers seemly still find normalized comparisons informative (Beier et al., 2015 Cell; Faget et al., 2016 Cell Reports; Kim et al., 2015 Neuron; Ogawa et al., 2014 Cell Reports; Smith et al., 2016; Wall et al., 2013; Watabe-Uchida et al., 2012 Neuron; Weissbourd et al., 2014 Neuron). Please refer to Figure 4G of Owaga et al., Figure 2D of Weissbourd et al. and Figure 3H of Faget et al. However, following the reviewer’s suggestion, we have now removed all statistical comparisons between ChAT and PV interneurons throughout the main Figures 2 and 3, and completely removed the Supplementary Figure 4. In the manuscript we have now focused mainly on the within-group comparisons (Figure 2B-F and Figure 4—figure supplement 1). However, we have left the significance markers in Figure 2A for the readers in the field to make their own judgments without us making any major claims in the main text. Please let us know if it is ok or if you would like us to remove it too. We thank the reviewer for calling this to our attention. TRN PV and SOM cells are seen throughout the AP axis of the TRN. The only unique topography is in the number of SOM-positive cells in the central tier of the middle sector of the TRN is lower than the number of PV-positive cells. Very few neurons display both PV and SOM markers (10-20%) in the somatosensory TRN (Clemente-Perez et al., 2017). We have added parvalbumin and somatostatin immunostaining of TRN to Figure 3—figure supplement 1E, F. Additionally, we have added a citation referencing the two main types of TRN neurons (PV and SOM) in the Results section of the manuscript (Clemente-Perez et al., 2017) (subsection “Thalamic projections to striatal ChAT and PV interneurons”, second paragraph). We thank the reviewer for pointing this out. We have added Figure 3—figure supplement 2 with representative in vivo recording sites for TRN to dorsal striatal recordings or GPe to striatal recordings to address this concern. We thank the reviewer for the comment on our ChAT ablation behavior and the comparison to the Matamales et al. (2016) ChAT ablation behavior. While our diphtheria-mediated ChAT interneuron ablation mice are able to successfully learn CRF and the Go/NoGo task similar to controls, we noted a persistent elevated baseline press rate after transition from CRF to Go/NoGo training. This inability to properly modulate behavior following a rule change (each press leads to reinforcer versus one press within 10 seconds of “go” tone leads to reinforcer) may potentially signal an inability to update behavior given a change in context. We did perform reversal experiment where we switched the “go” and “no go” tones in the presence of CNO activation of a Gi-coupled DREADD to suppress ChAT interneuron activity. However, we did not observe any significant differences following reversal between control and experimental ChAT inhibition groups in learning. It is difficult to completely interpret a negative result, including whether ChAT interneurons were significantly inhibited with CNO or clozapine during the experiment, so we did not include these experiments in the manuscript. Nevertheless, we have now removed all behavioral data from the ChAT- and PV-ablation experiments based on the reviewers’ advice. We thank the reviewer for the comment on the PV ablation data set. We concede that the PV ablation mediated disruption in CRF learning would preclude any subsequent stimulus response learning. However, due to variability in potentially the degree of lesion we had a subpopulation of PV ablation mice that were able to learn CRF, but were unable to learn the go/no go discrimination task. This role of PV interneurons in early associative learning is reinforced by two recent publications (Lee et al., 2017; Owen et al., 2018). However, we have now removed the diphtheria toxin-mediated ablation of PV interneurons experiments per the reviewers’ suggestion. Thanks for noting. We have now removed Figure 8 and all the behavioral experiments. The authors would like to thank Ed Callaway, Rui Costa, Tom Jessell, Chris Kintner, Saket Navlakha and members of the Jin lab for discussion and comments on the manuscript. This work was supported by grants from the NIH (R01NS083815 and R01AG047669), the Dana Foundation, the Ellison Medical Foundation, and the Whitehall Foundation to XJ. Animal experimentation: This study was performed in strict accordance with the Guide for the Care and Use of Laboratory Animals of the Salk Institute for Biological Studies. All of the animals were handled according to approved institutional animal care and use committee (IACUC) protocols (#12-00032) of the Salk Institute for Biological Studies. All surgery was performed under isoflurane or ketamine/xylazine anesthesia, and every effort was made to minimize suffering. © 2018, Klug et al.